Plastic contains a lot of hazards and they have been proven very dangerous and risky time and again leading to the ban of the not so Eco-friendly material in several parts of the world. 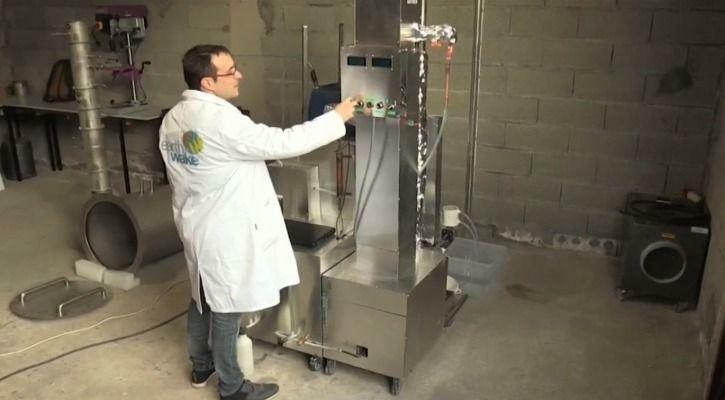 To help the world get over this highly risky substance, a French inventor has designed the innovative machine that converts plastic into petrol in a very simple way. After number of attempts by couple of scientist in the world are being made to dispose of plastic in the safe manner and some of them are absolutely groundbreaking. One such machine has been designed by Christopher Costes, a French actor, and a self-made inventor, and it has been named as Chrysalis. To develop the innovative machine, Costes worked with an environmental organization called Earth Wake. they plan to build a prototype into a commercial device. This prototype will cost around 50,000 euros. This is a machine which is relatively low-tech and is able to convert plastic waste to petrol and diesel. The machine consists of a 450-degrees-Celsius reactor. Bits of plastic are pushed into the reactor to pyrolise them, which is a method in which plastic is decomposed with the help of high heat. At the end of this process, this machine then produces a liquid which comprises of 65% diesel, 18 percent petrol, 10 percent gas, and 7 percent carbon. The diesel can be used in generators or boat motors, the petrol the machine produces can be used in heating or powering lamps. The gas can also be used for heating and the carbon for crayons or colorants. Currently, the machine is having good capabilities of converting 10 tonnes of plastic into fuel every month. One kilo of plastic can produce one liter of the liquid fuel. If not much, this is definitely a major plus for developing countries where fuels are costly and disposal of plastic is one of biggest problem.